Heat a oil in a pan and add onion and ginger strips when onion turns into pink colour then add ginger garlic paste. Now add turmeric powder and stir it for few seconds and add 4-5 tbsp water. Add mince and continuously stir it and break the mince with the help of spoon so that mince cant get lumps. Add red chilli powder and salt and cook it for 2 minutes. Put tomatoes and cook it until they are tendered. Now add grated beetroot and green chillies. Cook it until beetroots are soft. Squeeze lemon juice and sprinkle green coriander. Serve it with chapatis or puri. Hi Salma! 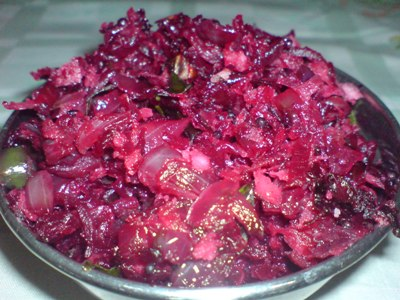 A very good recipe from u since beet-root is good for health.I just luv to try this one.